It’s Okay to Have Body Hair! It seems that body hair is a hot topic…when it comes to women at least. It’s seen as normal and natural for men to have hair on their legs, armpits, arms and faces but if women even have a little fuzz, they are instantly shamed and ostracized. Women aren’t allowed to do with their body hair as they wish…there is a demand that women must be hairless. Women didn’t really remove their body hair until the 1920’s. It wasn’t until this time that women could even show off any skin and with the advent of the flapper-girl and more freedom for women came the demand for body hair removal. Not only that, but in this area we saw the beginnings of new trends in makeup, dieting and primping as a whole. We see this same phenomenal holding true today. Women look to the media to tell them how they should be, what they should look like. The overwhelming message is that women must make themselves into plastic Barbie-doll like figures with impeccable clothing, decadent hair, perfectly applied make-up and of course hairless skin. If you see a woman with even some stubble on her legs, it’s viewed as unhygienic. The fact is, shaving has nothing to do with hygiene. Hygiene involves necessary bodily cleaning in order to keep you healthy and taken care of. The removal of body hair doesn’t fall into that category. It’s a societal idea that is enforced through cultural expectations, the media, friends and family. Not shaving can have serious social consequences. Women with hairy legs or underarms are usually viewed as unclean. I myself have experienced being shamed for having body hair. When I started high school, I began to explore feminism and issues around gender, body image and sexuality. One of the things that stuck with me was the inherent sexism that is involved with the societal demand that women spend hours on their appearance. This caused me to want to fight back, so I stopped wearing make-up and shaving my legs. My parents threw a fit and would refuse to take me to school or activities if I wasn’t clean shaven. I remember how angry I felt and powerless; my parents wouldn’t let me make my own choices about my body and were buying into a false idea about beauty. Shaving is a choice for men; they don’t have to remove the hair on their legs or underarms. Even the hair on their faces is really dependent on their personal preference, which is how it should be for both genders. As a society, we need to stop demanding that women live up to an unachievable beauty standard and give them back control over their bodies. Shaving may just seem like a necessary evil, but the only way we can create social change is to fight back. 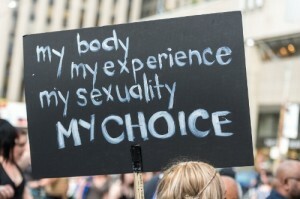 Make your own decisions about your body and accept other women for the choices they make. We need to stop shaming and start empowering. NY: Random House, 1997), 98.